If you’re looking for festive vegan spring recipes, this vegan quiche with asparagus and tomatoes is perfect for you. It’s a great recipe for Easter! Besides, the vegan quiche recipe is super versatile and you can use many other vegetables if asparagus aren’t in season. It’s asparagus season! Finally! It’s one of my favorite veggies and it always has been. I just love eating it with pasta or potatoes, but once in a while it’s also great to get a bit more creative with it. 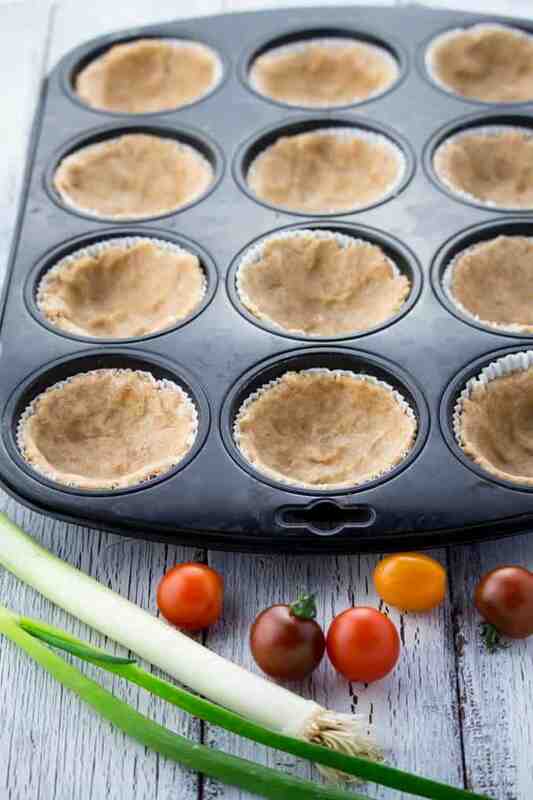 And these vegan mini quiches with asparagus and tomatoes are sooo good! As always, you can find the full ingredient list and the recipe instructions in a separate, printable recipe box at the end of this post. Instead of eggs, I used silken tofu, which I seasoned with herbs de Provence (thyme, oregano, rosemary, and basil), salt, and pepper. To give it its typical color and taste, I stirred in some turmeric and kala namak, which is also known as black salt. If you haven’t tried it yet you should really give it a try. It mimics the taste of eggs and is also great in tofu scrambles or vegan egg salads. It really tastes and even smells like egg! The recipe for this vegan quiche is pretty easy. However, the recipe takes some time as the dough for the crust has to rest in the fridge for about half an hour. And it takes another half an hour in the oven. But the actual preparation time is pretty short and the steps are very easy. STEP 1: Make the dough for the crust: Combine all ingredients in a bowl and knead into a smooth dough. Form a small ball and let it rest in the fridge for about 30 minutes. STEP 2: Meanwhile, cut the green onions into rings. In a medium pan, heat some oil and add the green onions. Stir gently for about 2 minutes. Set aside. Cut the asparagus into small pieces and cook in salt water for about 3 minutes. STEP 3: In a medium bowl, combine the silken tofu, the oil, the starch, the turmeric, the herbs de Provence and – if using – kala namak. Whisk until smooth. STEP 4: Chop the sun-dried tomatoes. Add them together with the green onions and the cooked asparagus (save the asparagus ends for the top) to the tofu-mixture and stir well. STEP 5: Divide the dough into twelve portions and place twelve baking cups into a muffin tray. Evenly press the dough balls into the bottom and all the way up the sides of the muffin cups. STEP 6: Fill with the tofu-mixture, top with half a cherry tomato and an asparagus end and bake for 30-35 minutes at 350 °F. Serve together with a green salad or as a snack. For the dough, I used whole wheat flour, but the recipe also works with all-purpose flour. For a gluten-free version, you can replace the wheat flour with a gluten-free flour blend. If you prefer to have one big quiche instead of several mini quiches, you can also pour the mixture in a regular quiche pan. If you do so, don’t forget to grease the pan before you press in the dough. The recipe is super versatile. I’ve also tried a vegan quiche with leek and tomatoes and spinach and mushrooms. You can just use this recipe and use any other vegetables you like. Broccoli, artichokes, and chopped kale also work well. And it’s also great with smoked tofu. We ate the vegan quiche along with a green side salad for dinner, but they are also great as a hearty snack or breakfast. How Long Does This Vegan Quiche Last? Properly stored in the fridge in an airtight container, this quiche lasts about 3-5 days. Can You Freeze This Vegan Quiche? No, unfortunately I would not recommend freezing this quiche. Freezing changes the texture of the quiche and when you thaw it it’s just not as good anymore. Also try my vegan tomato leek quiche with olives! It’s delicious, hearty, and it makes a great dinner all year round. I hope you like this vegan quiche as much as we do around here. If you give it a try, I’d love to know what you think about it. Just leave me a comment and a star rating below. Your comments really make my day! You like my recipes and want to see more? Then follow me on Facebook, Instagram, or Pinterest! 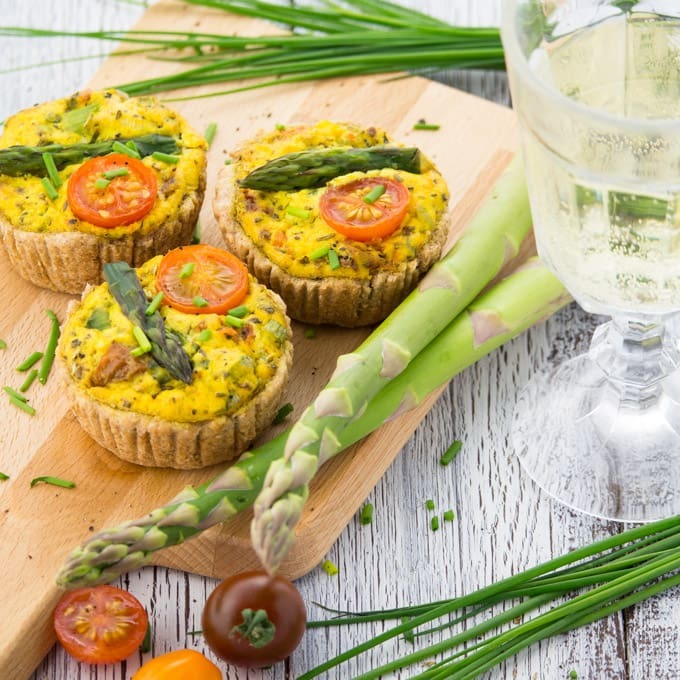 If you're looking for festive vegan spring recipes, this vegan quiche with asparagus and tomatoes is perfect for you. It's a great recipe for Easter! Besides, the recipe is super versatile and you can use many other vegetables if asparagus aren't in season. Make the dough: Combine all ingredients in a bowl and knead into a smooth dough. Form a small ball and let it rest in the fridge for about 30 minutes. Meanwhile, cut the green onions into rings. In a medium pan, heat some oil and add the green onions. Stir gently for about 2 minutes. Set aside. Cut the asparagus into small pieces and cook in salt water for about 3 minutes. In a medium bowl, combine the silken tofu, the oil, the starch, the turmeric, the herbs de Provence and – if using – kala namak. Whisk until smooth. Chop the sun-dried tomatoes. Add them together with the green onions and the cooked asparagus (save the asparagus ends for the top) to the tofu-mixture and stir well. Divide the dough into twelve portions and place twelve baking cups into a muffin tray. Evenly press the dough balls into the bottom and all the way up the sides of the muffin cups. Fill with the tofu-mixture, top with half a cherry tomato and an asparagus end and bake for 30-35 minutes at 350 °F (180°C). Serve together with a green salad or as a snack. The recipe is super versatile. I’ve also tried a vegan quiche with leek and tomatoes and spinach and mushrooms. You can just use this recipe and use any other veggies you like. It’s also great with smoked tofu. Ooo these are so cute!!! Spring + produce + cute little cups…all smiles! These look amazing, Sina! I love quiche in the springtime. I tried tofu quiche for the first time recently and couldn’t believe how good it was! I love how these are individually sized, they look so cute and delicious! I’m obsessed with asparagus right now! I’m using it in so much. This looks delish!!! This looks like the perfect and cutest Spring dish! Beautiful Sina! These look so good, Sina!! I am a huge fan of food in mini form. :) And that asparagus – it’s beautiful!! Definitely going to try these! These are so pretty! I love that you can make quiche with tofu. I love how versatile it is. I definitely have to try these. These are the cutest little quiches! Those mini crusts and perfect garnishes–I just love the look of them! I am a big quiche fan, but I don’t think i’ve ever had one with an actual crust on it :o Asparagus and I are not the best of friends, but your other veggie combo ideas like the leek tomato or spinach mushroom both sound fantastic! Quiche is one of those things I never know if it should be dinner or breakfast, it’s just perfect always! These little quiches look so pretty. I love the colours. Tofu is such an amazing ingredient and I love asparagus. Just perfect for Spring! These are just so darn cute Sina, and based on the ingredients, I can tell that they taste AMAZING! Okay everything about this post I am in love with. Vegan quiche!? Who knew there was such a thing!? And those photos are just gorgeously styled. I can’t stop staring! 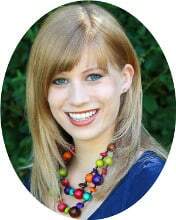 Pinning and sharing on my social media sites! This looks like a great option for Christmas morning! Has anyone tried this in a full pie crust? I just tried this vegan quiche yesterday because I’d like to make it for Easter and I really liked it! Making it again next Sunday for the family! Thanks! !